U.S. President Barack Obama finally gets his own Twitter account, and that's @POTUS. What does that stand for? President Of The United States! 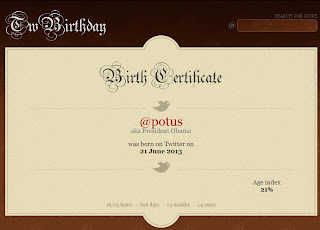 The account though is not new as the handle Twitter handle @POTUS was created in June 2013, almost 2 years before it ever got used. In less than 24 hours, around 1.6 Million people started following @POTUS. His 1st tweet also received over 226K retweets and 301K favorites. With the astonishing number of engagements and followers in the hundreds of thousands, it would be surprising to see people mentioning @POTUS. 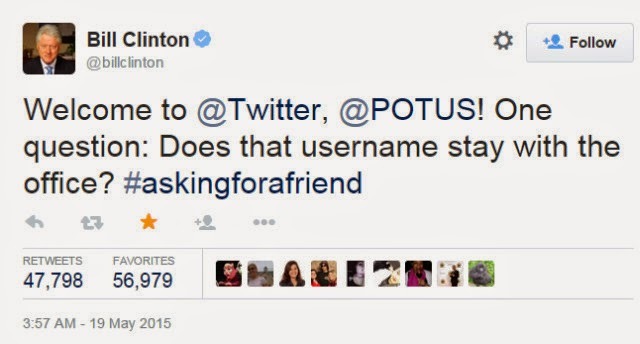 But who's the very 1st person @POTUS replies to? 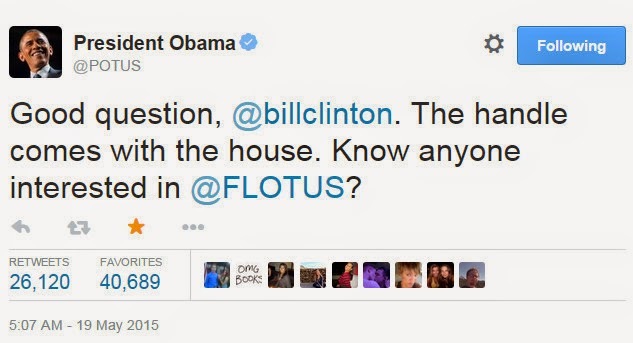 Unexpectedly, it was to @BillClinton who asked if the @POTUS Twitter handle gets handed down to the next U.S. President. 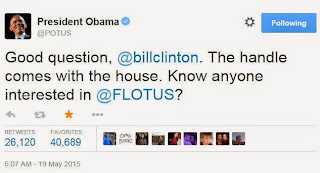 From a social media standpoint, this tweet is a brillant way of the Clintons' capitalizing from the surge of @POTUS social media traffic and making their presence known. 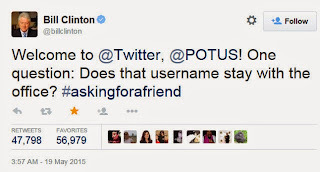 While @BillClinton does pose a legitimate question since Preisdent Obama's presidency is soon to end, it does so in a very wittingly way especially using the hashtag #askingforafriend as a subtle (and clever) way for referring to @HillaryClinton. @POTUS replies and tries to be witty too asking if anyone is interested in the @FLOTUS account which stands for First Lady of the United States.